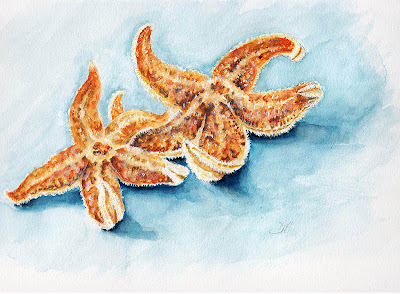 I was just checking out the fine details of the starfish and go "WOW!" =) admiring the progress so far, and I really like the spring roll drawing as well... just looks so inviting! Great work, I wonder what the Chinese use them for? Love the other (graphite) one too. Also...just had a sneeky peek at some of your other work and I think its wonderful. In progress? Not done? Wow. Can't wait to see the finished version. In progress?! They look done to me. These starfish are dancing!! Unbelievable how you can capture texture so well in your paintings. I can feel the roughness. These are great! I like the colors you've used, and I'm admiring the shadows in the blue. It's such an unusual blue, it makes the starfish stand out so exquisitely!